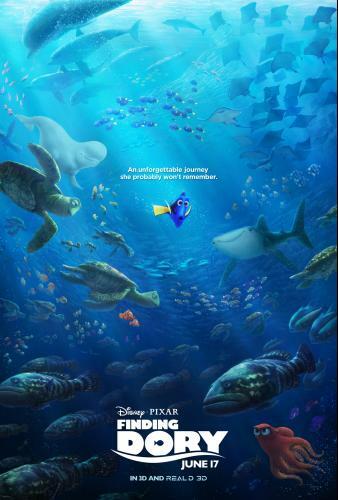 "Finding Dory" opens with Dory as a very young fish being raised by two loving parents. I had never thought of Dory as having special needs until I saw her as a little one that couldn't remember anything or play normally with other young fish. I thought it was touching how patient and loving her parents were with her and how hard they worked to prepare her for adult life. Sadly, Dory ends up getting separated from them and growing up without her parents. Now that she remembers having parents, she feels the need to find them and brings Marlin and Nemo along for the ride. While the journey could be frustrating at times, it was fun and it made me laugh. Nemo's fish tank friends from the first movie are absent but a new cranky yet lovable octopus, a beluga whale, and a whale shark join the cast. It was fun getting to see one of the most beloved characters from "Finding Nemo" have a movie centered around her. Dory continues to be quirky and lovable. Great film for the whole family! ~Special thanks to Allied Integrated Marketing for the opportunity to attend an advance screening of Disney Pixar's Finding Dory in 3D for free in exchange for my honest review. All opinions are my own.